The ability to own a firearm in the United States is one of the most important legal rights for residents in the country. While citizens have a right to bear arms, there are legal restrictions that are designed to protect the safety of all. In the state of Florida individuals who violate existing firearm possession laws are charged with stiff penalties. These legal consequences have been put into place by advocates of gun safety and not understanding Florida firearm offense penalties puts all current or prospective firearm owners at risk. The state of Florida currently recognizes two types of possession: actual possession and constructive possession. Most people are familiar with actual possession, which involves having a firearm in your physical possession. In most cases of actual possession a person will have a firearm in their hand or physically secured to their body. Constructive possession occurs when a firearm is in the immediate proximity of a person. This typically involves a firearm or gun being in an individual’s vehicle or within a home that they occupy. When this type of possession occurs the State of Florida must prove that the defendant knew that the firearm was on the property and had control over the weapon. Often knowledge and control is established or proved by the police conducting an interview. During the interview the police will attempt to gather statements to later use against the defendant. Florida is known for having some of the harshest gun related penalties in the United States. One of the most discussed firearm offense penalties in Florida is the ten-year minimum sentence. Defendants who are found guilty of various crimes (aggravated stalking, trafficking controlled subjects, carjacking, etc.) while in possession of a firearm are sentenced to a minimum of ten years in prison. The sentence is mandatory and the judge is unable to reduce the term served and the defendant is not able to receive gain-time. If a person discharges a firearm when they commit a crime that they are later found guilty of, the penalties increase dramatically. 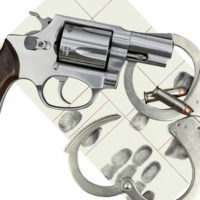 A person found guilty of aggravated assault, arson, burglary, trafficking certain controlled substances, abuse, and other crimes who discharges a firearm is will receive a minimum of 20 years in prison. In 2010 a Florida woman was given a 20-year sentence after firing a warning shot in the presence of her husband during an alleged incident of domestic violence. Incidents that result in a person being injured by a shot require a minimum sentence of 25 years to life in prison. If you or someone you know is charged with possession of a firearm it is important to seek the assistance of an attorney as soon as possible. Failing to receive guidance from an experienced firearms attorney places you or your loved one at risk of receiving harsh prison sentences. Contact the Mander Law Group today and schedule an appointment to discuss your situation. Conveniently located in Dade City, we are able to answer your questions and provide you with the advice you need.